We had a long, progressive run-up to Chestnut's labor this year. Day by day she demonstrated more signs of imminently going into labor but not until she showed every conceivable sign, a full week after I thought she would go into labor, did she actually do so! 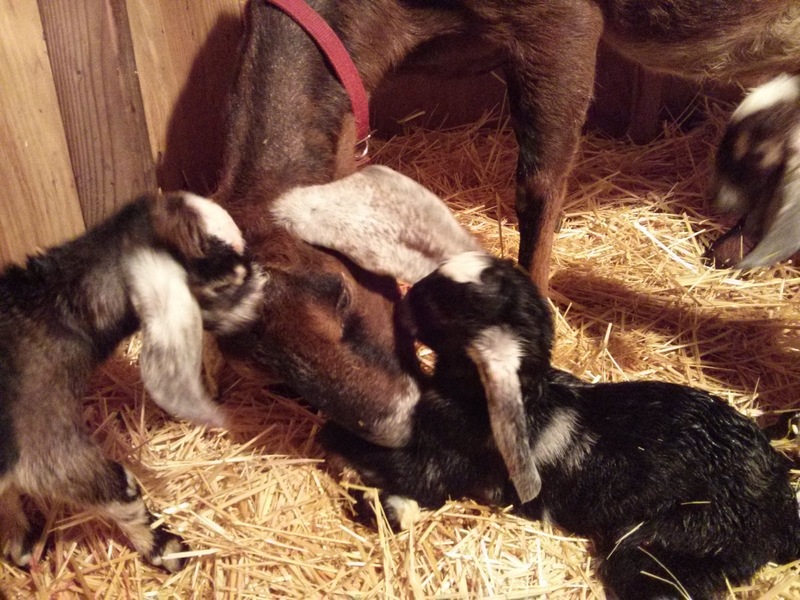 She started with vocalizing to her babies, frequent urinating, and passing her mucus plug. Then pawing, total loosening of ligaments, and the babies "dropped." Several days I had her cooped up in the birthing stall since she always showed more obvious signs in the morning only for her to calm down after noon and I'd let her graze freely with Rosemary. Veeery pregnant and uncomfortable. I sympathize. 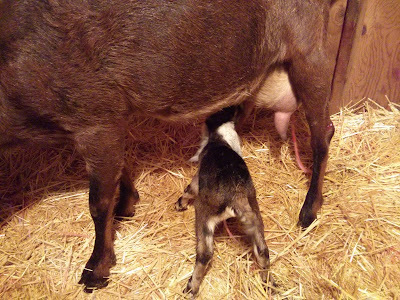 FINALLY her udders became painfully swollen, she was only mildly interested in eating, and after a few hours in the birthing stall she actually starting having contractions. Since I needed to help her through transition in both her previous labors I had no intention to leave her alone. You can see the bag of waters bulging here. First to come out, a beautiful tri-color male! A black and white male. He needed some help to stand. A surprise beautiful chocolate male. Count them. Three males! That makes seven males and one female (who didn't make it) in three pregnancies. Sheesh! It is on the rare side to have more than two kids per pregnancy. The second one was the largest but he had a difficult time getting his back legs to work. 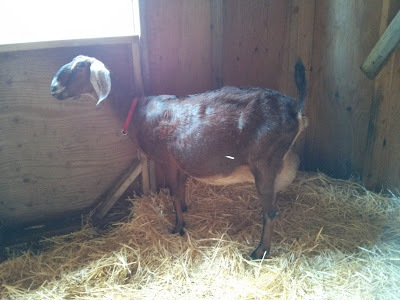 After two or three days of frequently helping him --call it goat physical therapy-- he was consistently getting up on his own. A week later he's prancing around with his brothers none the worse for wear. 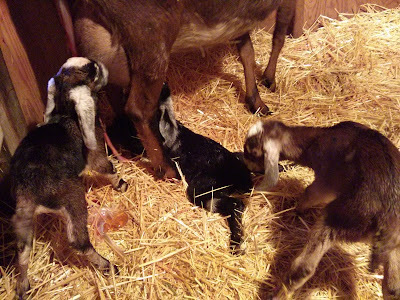 One funny thing that has developed is the kids started off only eating on one side so the other udder was neglected except for once or twice a day when we drained it for her comfort. With a little encouragement they are now eating off both sides. Unfortunately, the damage was done and that other side will likely always have supply issues. Yep. I know these things. Rosemary is due next about three weeks after Chestnut. Rosemary in foreground, Chestnut behind. We studded Rosemary with a second male, unrelated to the first, so that, theoretically, I can breed Chestnut and Rosemary's kids. It looks like the third born, Mocha, will be the best breeding choice because the biggest one, Americano, had difficulty standing up and the first born beauty, Latte, has a tender nodule under his right ear. Dunno what that could be. 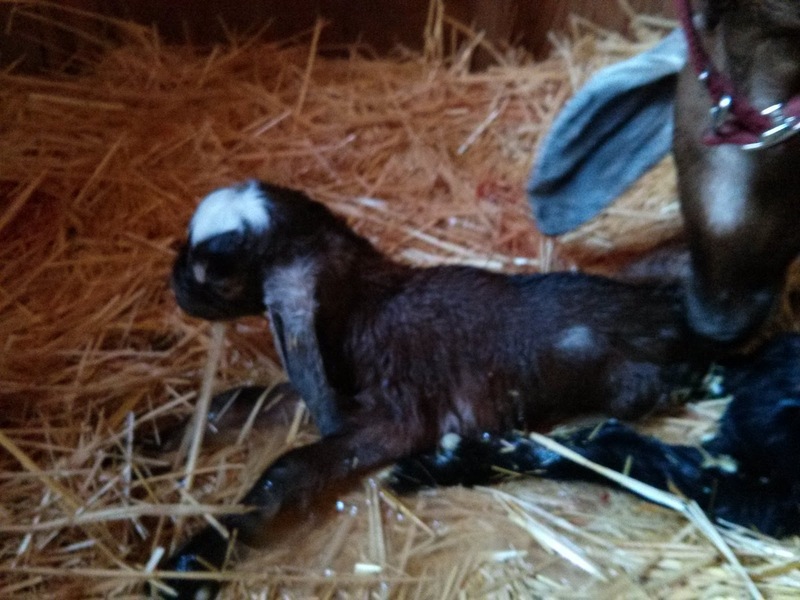 Hopefully Rosemary will kid at least one breed-worthy female so I can ultimately replace Chestnut with better milking genes. If I hadn't already decided that Chestnut wasn't the best milking stock her third labor would have sealed it. Her labor took many hours again with nearly the maximum window of time recommended between each kid. 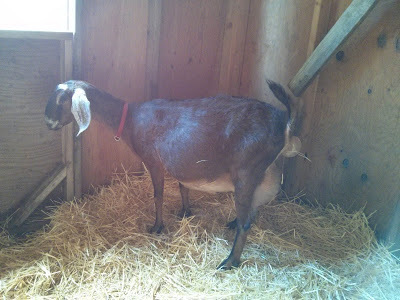 She didn't cooperate with any contractions and was generally unnerved. The quantity of kids she has produced is overshadowed by the quality of her kids: below par. Her milk production is okay, but nothing to write home about. She is a decent milker now but she was difficult to train to hold still. She has spoiled many buckets of milk! 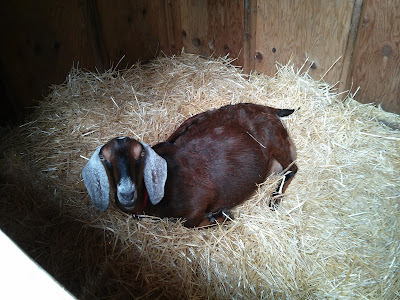 Hopefully, I can find a loving home for Chestnut and begin my own breeding lines with Rosemary as the matriarch. 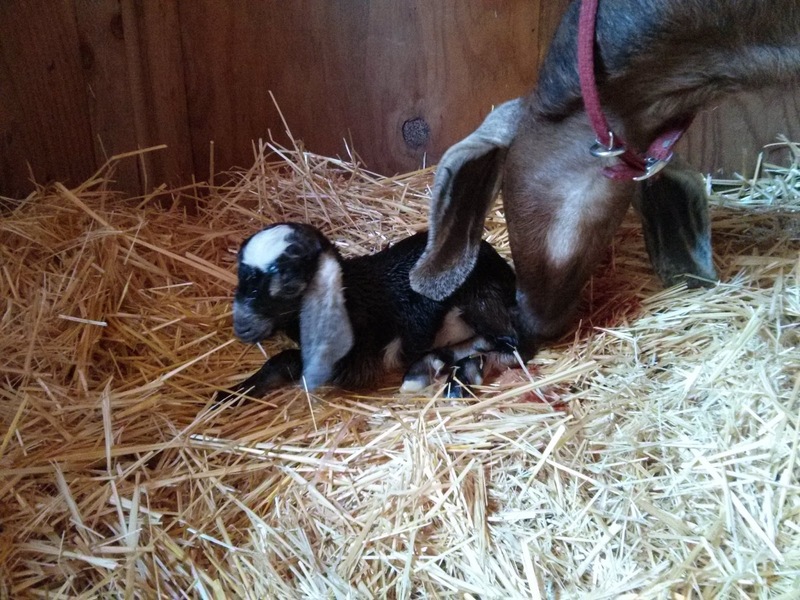 Keep an eye out for updates on Rosemary's delivery!